Can You Guess the Fastest-Growing Big Bank Over the Past Decade? Three banks have nearly quadrupled in size since 2006, leaving their peers in the dust. The past decade has been a blessing and a curse for banks. Those that succumbed to the siren song of subprime mortgages in the years before 2008 paid a heavy price afterwards, recording heavy losses, if not outright failure. But those that maintained their discipline through the housing bubble were perfectly positioned to later profit from their peers' mistakes. You can see this distinction clearly by looking at the growth trajectories of banks since 2006. Not unlike a cycling race, where a small group of riders separates from the main palindrome, three banks have surged ahead of the pack over the past decade while the rest have plodded along more modestly. 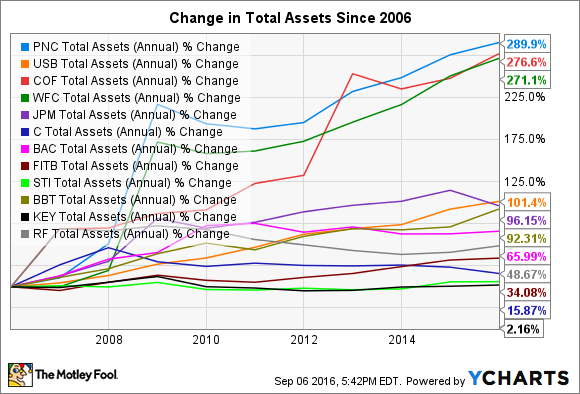 PNC Total Assets (Annual) data by YCharts. The key to running a successful bank is the ability to operate countercyclically. It's much like investing in this way. If you're buying stocks at the same time that everyone else is, then you're probably paying too much. The trick instead is to wait until everyone else is selling. That's when you'll get a good deal. In the context of banking, this means that a bank shouldn't lower its credit standards in order to attract borrowers when the economy is humming along and competition to make loans is stiff. That was the essence of the subprime mortgage crisis. It also means that banks should wait for downturns in the economy to make major acquisitions of their own. Just like stocks, that's when entire banks can be picked up at steep discounts to their former prices. It may go without saying, but these two things are related: Banks that can't resist the first don't have the luxury of benefiting from the second. It's the ability to operate countercyclically, in turn, that sums up the success over the last 10 years of PNC Financial, Wells Fargo, and Capital One. Because all three of these banks largely maintained their credit discipline in the years before the crisis, they were positioned to acquire peers that didn't. Wells Fargo acquired its larger, East Coast-based rival Wachovia in 2008. PNC Financial purchased its bigger neighbor National City Corp. soon thereafter. And Capital One bought Chevy Chase Bank in 2009 as well as ING's online banking platform three years later. Each of these banks has since gone on to complete smaller deals and grow organically. The net result is that they've nearly quadrupled in size while the typical bank has grown over the last decade by a comparatively measly 50%. The point is that banking is about more than interest rates and efficiency. Those are important, but the most fundamental quality is a culture that reflects the resolve to go against the grain.